Shopping at Home Depot a few weeks ago, I noticed this sign as I was leaving the store. My cashier did give me great service even though I went through their Self-Checkout lane. She came over to see if I was comfortable using the system, asked if I had found everything I needed, and thanked me as I left. To me, this was great customer service. She created a personal connection that gave a face to the experience. Technology can be wonderful to be efficient and quick, but it typically leaves one with no feelings or emotions regarding the experience. Does that matter? Studies show that loyal customers feel a connection to the business that goes beyond an efficient transaction. I rang the bell as I left, but I don’t know how many people felt comfortable in doing so. Was someone monitoring how many times the bell was rung in an hour? 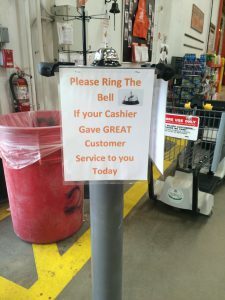 Probably not, but the key is that it created an awareness of Home Depot’s concern that as a customer you experienced great customer service at the last point of contact with them – the cashier. And, typically, when something is being measured, it will improve, just because someone is paying attention to it. With the holiday season here, you have an opportunity to reach out to many customers and potential customers. What are you doing to see what they think of your customer service and whether you are providing good service or not?